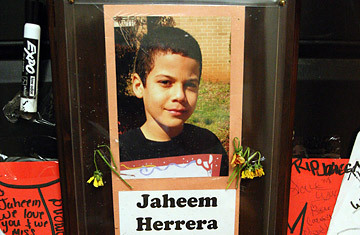 A photograph of Jaheem Herrera, 11, hangs above a poster on the front door of his family's DeKalb apartment, part of a makeshift shrine. Which Kids Are Most Vulnerable to Bullying? Suicide as a result of bullying or any other cause is rare among children under the age of 14. Recent statistics from the CDC cited one suicide for every 100,000 kids, which is down slightly from six years ago. But an estimated 160,000 students stay home from school every day because of bullying incidents, according to Dr. Allan Beane, a former teacher and bullying expert who authored The Bully-Free Classroom. "These kids get angry and frustrated, and it creates this sort of toxic shame within them," he says. "They also have gotten to the point where they can't trust adults to handle their situation right, so they wonder how they'll cope." Like several school districts, DeKalb County relies on outside organizations such as the Anti-Defamation League or consultants like Beane to identify bullying problems in its schools and show how to address them. But Beane says the challenge is ensuring that schools make bullying prevention part of their culture, with staff who are trained on what to look for, students who understand the consequences of picking on a peer and parents who enforce discipline and respect at home. "We are working hard to make sure there is a universal understanding of what bullying is," said Dr. Gale Thomas, director of student-support services for DeKalb County schools. In general, Thomas said, bullying can be reported to any adult at school. A report leads to an investigation and appropriate discipline. After three reports of bullying, an accused bully is supposed to face a hearing, Thomas said. Complicating the Herrera case is Moore's findings that the boy sometimes actively participated in fights. Can the bullied also be bullies? Although many schools across the nation have anti-bullying and anti-hate programs in place, experts acknowledge that these programs can be challenging to maintain, especially when teachers are already stretched thin. "Maybe we've reached a time in society when we can't allow school kids to be unsupervised in hallways and parking lots and stairwells," Beane said. "Some schools, for example, have an adult at the top and the bottom of the stairwell, monitoring kids between classes. These schools have cameras in the hallways. They have a culture in place that is preventative instead of reactive. But all of that takes money and training to understand what to look for and how to handle it." Although bullying is not new, administrators and experts say there is a greater understanding of the need to keep it in check. "Bullying isn't swine flu," Nigut said. "It's not some new virus that's come out of nowhere. It's something that has been around at least since I was in school. But back then, we didn't look at it as destructive behavior. Now we know that bullying has strong repercussions, and more and more schools know they need to address the problem."